I find this an ideal size flask for 10 gal. batches. Good price, and I need larger than 2L flask for older yeasts. What size stopper fits this flask? BEST ANSWER: A #10.5 Stopper should fit Y440 well. #10.5 is too big for this flask - I bought one and it didn't fit. a #10 fits just right. Is the bottom flat? The one i have from elsewhere doesn't and it is useless on my stir plate. BEST ANSWER: Yes, the bottom is flat and this will be great for making a yeast starter. What high of the flask? BEST ANSWER: 14-16 inches in that range is my guess. Not at the brewery at the moment. The flask is approximately 12.5 inches (31 cm) tall. the 3000ML is 12 and 1/4 inches high. Great flask! Perfect size for doing a starter. Gives more flexibility with the size of the starter needed! I used this to make a 2.4L starter and still had plenty of headroom. Note that a #10 stopper fits well, not a 10.5 as suggested in the Q&A section. Love the size of the 3000 mil. flask. Good price and it is an excellent size for two stage starters. I just unpacked and cleaned 2 of these. 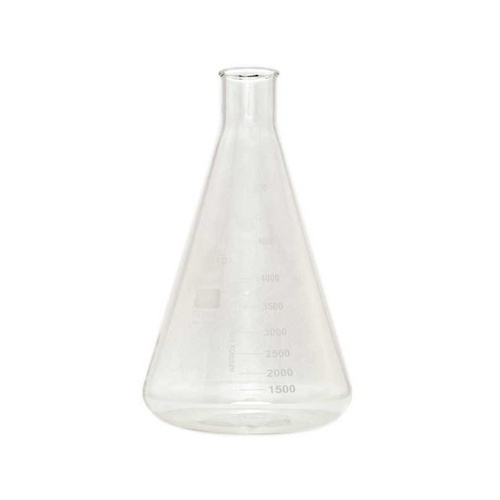 They are very high quality thick walled flasks. I will put them to the test!